Forum About Proxy > Forum (only english) > General discussions > Lesson 2.2: What is server and IP address? All web sites are located on the special, very strong computer called Server. Such servers are connected to the Internet for 365 days per year, so they could be accessed by anyone and at any time. Btw all computers connected to the Internet have their own unique address to be determined by others. Such address is called Internet Protocol (IP) address. It is similar to your passport number which is unique within your country and could be used to identify you. Such IP address has formatted with four numbers separated with dots. Each number could get values from 1 up to 254. 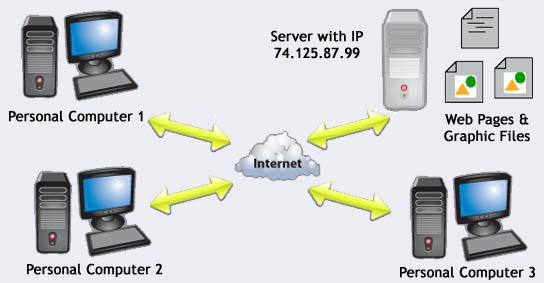 For example: 74.125.87.99 is valid IP address of server which is connected to the Internet. You can even try to open a web site which is located on it. To do so just type http://74.125.87.99/ in your Internet browser's address bar. Wow, do you see google.com web site? That is right, that IP belongs to one of the google's servers. Question: why browser opens google.com if we did not type it in the address bar? Let me explain. In previous paragraph I told you that all computers connected to the Internet have their own UNIQUE IP address and we make comparison with your passport number.